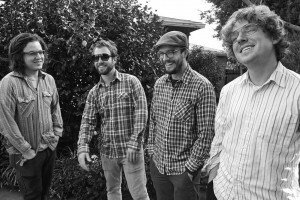 The Henry Clay People are a rock and roll band from Los Angeles. With common comparisons to Pavement andThe Replacements they play a type of no-frills, pretention-free rock that has sorely been missing from LA. The band is made up of brothers Joey (vocals, guitar) and Andy (guitar, vocals) Siara, Jonathan Price (bass, vocals) and Eric Scott (drums). Last year, the group released Blacklist the Kid with the Red Moustache to much critical acclaim. The album was produced by Howard Bilerman (Arcade Fire, British Sea Power) and Colin Stewart (Frog Eyes, Pretty Girls Make Graves). Over the past year they have taken that momentum and have further firmed their hold on Los Angeles with plays on Indie103.1, KROQ and Sirius Satellite radio, a residency at The Echo, high profile shows alongside the likes of The Whigs, Bodies of Water, Quasi, Frog Eyes, Broken West and a spot at this summer’s Sunset Junction Fest with !! !, Beachwood Sparks, Black Keys, Cold War Kids and more. A standout set at SXSW in March highlighted their chaotic-but-still-all-in-good-fun live show that led Esquire to declare them “the most intoxicated band in Austin” and that “the usually amazing band was made even more amazing by the fact that they could barely stand.” This is The Henry Clay People. A band that plays every show with the same amount of energy and love whether it’s to a crowd of hundreds or to a crowd of a few. For Cheap or For Free is a family affair. Recorded at different studios in LA with the help of Joe Napolitano (Le Switch), Dave Newton (The Little Ones, The Movies), Raymond Richards (Broken West, The Weather Underground) and Wendy Wang (The Sweet Hurt, Correatown) it also feature’s guests from local bands Le Switch, The Sweet Hurt, I Make This Sound and Idaho Falls. The songs on the album feature bright telecasters, honky tonk piano, Heartbreakers worthy drumming and the occasional pedal steel. As a twenty something himself, Joey Siara’s lyrics deal with the issues one would expect; growing up, being broke, being in love, caring about the future but also trying to resist it. “Working Part Time” is an ode to merely getting by, the beauty in the little things, as he sings “I was broke but still alive, yeah, I was fine.” In “This Ain’t A Scene” he talks about not settling down until he’s seen everything and on “Fine Print” touches on faith and feeling lost, “we got caught believing, we were tired of leaving our futures up to fate.” Green chimes in too on his tune “Bull Through” as he sings “We were doing nothing but paying our rent.” Straight for the throat rockers and anthems mesh well with country ballads and ramshackle living room numbers. The Henry Clay People have delivered a vital album full of celebratory rock and roll for an audience that is desperate for just that.